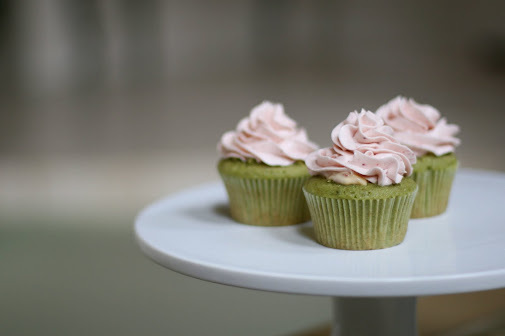 Today's post will be short and sweet, just like these cupcakes! 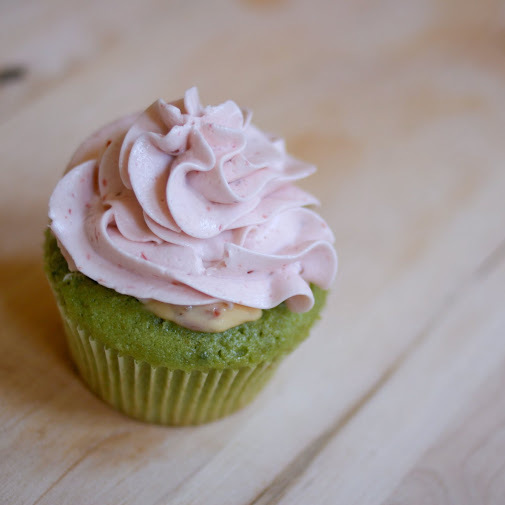 Basically, if you combine a perfectly moist little matcha cupcake with the easiest fresh strawberry custard and top it with an impossibly perfect fresh strawberry swiss meringue buttercream, the results are spectacular! And, of course you cannot deny how impossibly beautiful these things are. I love the combination of this green and pale pink together. But, the combination of green tea and strawberry is much, much better! 2. Cut a hole in the cupcake. 3. Fill the hole with strawberry custard. 4. Top with strawberry buttercream! Preheat the oven to 325 F. Line a cupcake tin with liners and set aside. In the bowl of an electric mixer fitted with the paddle attachment, combine flours, sugar, baking powder, salt and matcha powder. Mix on low speed until combined. Add the butter, mixing until the cubes of butter are peanut sized or a little smaller. In a large glass measuring cup, whisk together the eggs, milk and vanilla. With the mixer on medium speed, add the wet ingredients in 3 parts, scraping down the sides of the bowl before each addition; beat until ingredients are incorporated but do not overbeat. Divide the batter evenly among liners, filling about 2/3 full. Bake until an inserted toothpick comes out clean, 17 - 20 minutes. Transfer to a wire rack and let cool completely. To make the custard, whip the first four ingredients together until it is well combined and begins to thicken, about 3 - 5 minutes. Place in refrigerator to let chill and thicken some more until ready to use. Chop the strawberries into small dices, and place onto a paper towel lined plate. Place some paper towels on top and place in the refrigerator to allow the water from the strawberries to seep out, about 10 minutes. Once most of the water has been released, fold the strawberries into the custard and continue to refrigerate until ready to use. To make the frosting, put the egg whites and sugar into the bowl of an electric mixer. Place the bowl over a pot of boiling water making sure the bottom does not actually touch the water. Stir the egg whites until the sugar is dissolved. Remove from the heat and place into the mixer stand. Beat until it becomes white and doubles in size. Add the vanilla on low speed, then add the butter, one piece at a time, making sure it is well mixed after each addition. Do not worry if it looks curdled, it will take some time for it to come together. Continue beating for 5 - 10 minutes until everything comes together. Add the strawberry puree or preserves until desired berry taste. Spread/ pipe/ smother onto your cupcakes and enjoy!! Soooo pretty! I went to a pretty preppy college, so green and pink used to remind me of frats and double popped collars (not really pleasant). But now enough time has passed that I can readily appreciate the beauty of the combination. 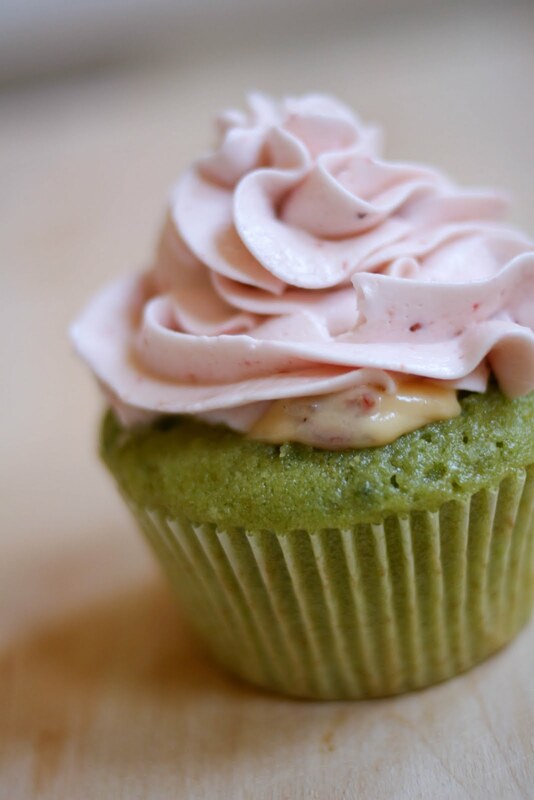 8) And of course strawberry and matcha sound amazing together! These cupcakes look absolutely gorgeous. 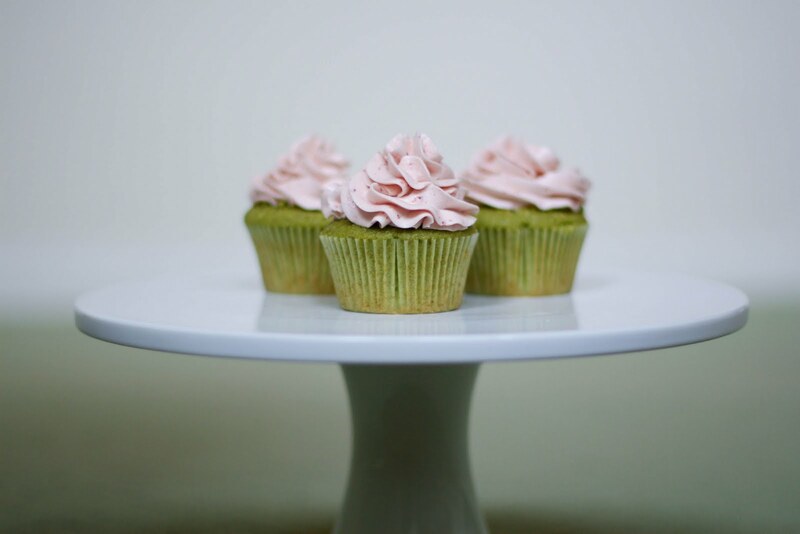 Love how the green of the matcha accentuates the pink of the frosting. Oh wow, these look amazing. Love the colors and flavor combination. Look at those beautifully piped clouds of frosting! the colors in these is outstanding! i want to make some baked goods with green tea and I just may have to start here! these look delish and again, the colors make me happy! Wow, these sound amazing. You say "green tea" and I am there. Your photography is beautiful! Looks amazing, and the photos are gorgeous!!! However, before I trying making these, I noticed that the strawberries were accidentally omitted from the custard portion of the recipe. Wondered if you could clarify the amounts for the custard? do you mind telling me what tip you used to frost these? (are they closed star?) they are absolutely beautiful! I made these for my 22nd birthday party and had a lot of trouble with the frosting! They still turned out great tasting but not esthetically as beautiful as yours. I had a problem getting the egg whites/sugar to double in size as well making them the night before the custard made the cupcakes a big soggy. I want to re-try this recipe and get it perfect because the flavour is so darn good, any tips to get my frosting looking more fluffy, mine looked wet and chunky! filled cupcakes definitely don't last as well as regular cupcakes, so i recommend filling them just before serving or 3 - 5 hours before tops. as for the frosting, swiss meringue can be a bit tricky. when beating in the butter, it should appear 'chunky' and not at all edible but the trick is to be patient. just keep on whipping until it appears smooth and buttery - this can take up to 15 - 20 minutes, so it's really important to be patient! also, when adding the puree or preserves, add it little by little. too much can break the buttercream and turn it into a goopey mess, so just add little by little, that way you can notice when the buttercream starts to loosen TOO much! 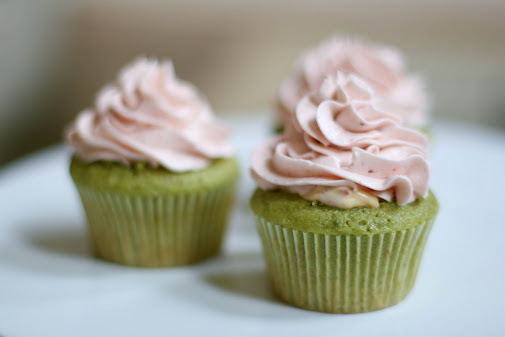 I was looking for a green tea cupcake recipe and I stumbled onto your site. Where do you buy matcha powder? I made these, it yielded 12. I used convection bake set at 325 (self adjusts to 300) and at 20 minutes they were not done. I added 5 more minutes at 350 and they were done with slight browning at some edges. Most overflowed the liner slightly and this made removing from the pan dodgy. The ones that didn't overflow domed nicely and looked best. They are very crisp at the edges. I may put the custard on the side, not sure yet. I'm kind of afraid to cut into them. Wow, I got brave and cut holes and piped in the filling. The cake was softer after sitting under plastic wrap all night. Everything turned out wonderfully. Even my first attempt at SMBC and my homemade strawberry jam. These were for my DIL's birthday and she was delighted with them. Thank you for the great ideas! I did a double batch of frosting and used most of it but otherwise followed your recipe. I was amazed how much of the tea flavor came through. Winner! Just made these for High Tea. The girls loved them. I had to make the frosting twice because the first one didn't go firm. Possibly because I used fresh strawberry puree in the first lot? I'll definitely make these again. Thanks for sharing the recipe. I made them for all of the teachers at my sons school for teacher appreciation week. everyone LOVED them! May be my new favorite cupcake! I made three batches of these for Mother's day (for all the mothers at my church) and tried out a few. FANTABULOUS. Not too sweet, and just a wonderful blend of green tea and strawberry/vanilla custard. Took a few hours to make but was definitely worth it. This recipe is a keeper. Definitely making these again. Hi, I made these last week. They are indeed beautiful and the cupcake/filling are delicious but I encountered some problems with the frosting part of the recipe. Firstly, the recipe made double the amount of custard than necessary (which was ok because I just ate it on my own later on in the week). I had a lot of trouble with the SMBC. I even tried it twice and had the same problems. I finally looked for a demo of SMBC on youtube and found that they started the eggwhites and sugar out on the double boiler with a hand whisk, then transferred it to the kitchenaid with the whisk attachment and then - when the peaks had formed - switched to a PADDLE attachment and incorporated the butter in even smaller bits every 10 seconds or so. Once I saw this I cut my butter up smaller, and changed to a paddle and it finally came together, but the icing was way too buttery (tasted like butter actually) and also not enough for all the cupcakes. I was only able to ice 9 of them. CORRECTION: youtube demo used 4 egg whites, 1 cup sugar and 1 1/2 STICKS of butter. These look absolutely delicious! Since it was meant to make 12 cupcakes, do you think that amount of cake batter could be used to make a regular two tiered cake? Hi Normal Girl, for a two tiered cake, I would probably double the recipe! Your icing skills are impressive! I might just join you on this one, I’ve got an Earl Grey recipe I’ve been meaning to try. 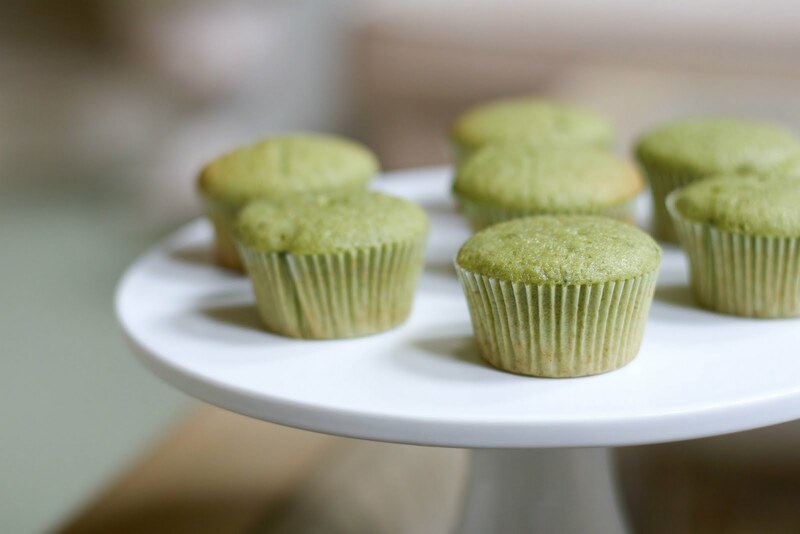 I’ve made green tea cupcakes before and some recipes resulted in dense and dry cupcakes. Is yours more light in texture? Were they moist? Btw, those pictures are adorable! Strawberry is one of my favorites. I will be giving this a try. This is awesome ill be trying this for sure.